It is known that people with rheumatoid arthritis (RA) are at increased risk for morbidity and mortality from cardiovascular disease—a risk that is said to be comparable to that in people with type 2 diabetes. In people with rheumatoid arthritis, there is an increased risk of silent myocardial infarction (heart attack) and sudden death. The prevalence of myocardial infarction is more than two times higher in people with rheumatoid arthritis compared to the general population. The causal relationship between cardiovascular disease and rheumatoid arthritis is complex and appears to be related to several factors. Traditional cardiovascular risk factors (e.g., hypertension, obesity, smoking, diabetes, high cholesterol), as well as rheumatoid arthritis severity markers, are contributory. There is an excess risk of cardiovascular disease that occurs early in the disease course of rheumatoid arthritis, which may even pre-date disease onset. Inflammation plays a key role in cardiovascular disease. People with rheumatoid arthritis appear to have accelerated atherosclerosis, which is itself considered an inflammatory condition. It may be that the inflammatory process of rheumatoid arthritis along with an excess of proinflammatory cytokines contribute to the formation of plaque. The autoimmune-mediated inflammation of rheumatoid arthritis contributes to increased endothelial dysfunction, oxidative stress, and the activation and migration of leukocytes (white blood cells) within blood vessels. The adhesion of leukocytes to vascular endothelium is the distinguishing characteristic of the inflammatory process. Systemic inflammation associated with rheumatoid arthritis in combination with cardiovascular risk factors that are associated with lifestyle may contribute to excess cardiovascular disease in rheumatoid arthritis. Why Is the Connection so Important? Approximately half of all deaths in people with rheumatoid arthritis are associated with cardiovascular disease. 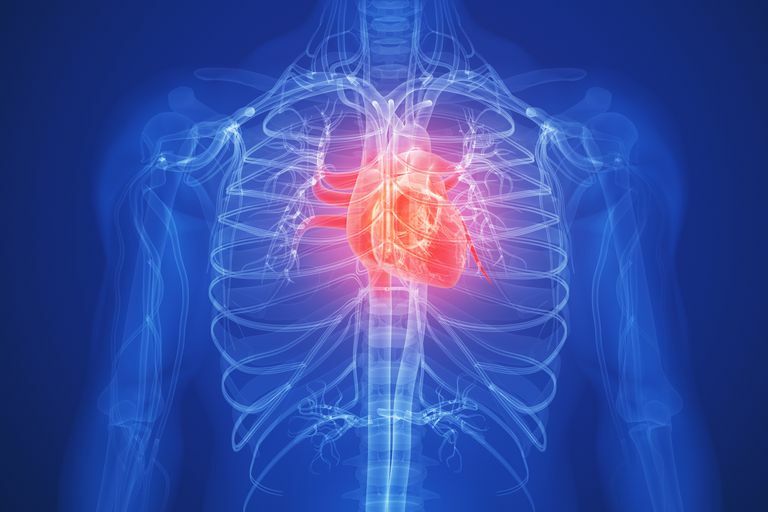 Cardiovascular mortality is increased by 50 percent and the risk of cardiovascular disease is increased by 48 percent among those with rheumatoid arthritis compared to the general population. People who have had rheumatoid arthritis for a long time, those with extra-articular manifestations (i.e., affects more than just the joints), as well as those with rheumatoid factor and anti-CCP (autoantibodies) have the highest risk of cardiovascular mortality. Managing the risk is essential. In 2009, EULAR (the European League Against Rheumatism) assembled a task force to put forth recommendations for managing cardiovascular risk in people with rheumatoid arthritis. The recommendations were updated in 2015/2016. There are three overarching principles provided by EULAR—and of 10 recommendations offered, one is new and six were changed from the 2009 version. 1. Doctors must be aware of the higher risk of cardiovascular disease in people with rheumatoid arthritis compared to the general population. 2. The rheumatologist should ensure that cardiovascular disease risk management is performed in rheumatoid arthritis patients and other inflammatory joint diseases. 3. The use of NSAIDs (nonsteroidal anti-inflammatory drugs) and corticosteroids should be according to specific recommendations from EULAR and ASAS (Assessment of Spondyloarthritis International Society). 1. Disease activity should be controlled optimally in rheumatoid arthritis, ankylosing spondylitis, and psoriatic arthritis so as to lower the risk of cardiovascular disease. 2. Cardiovascular disease risk assessment is recommended for those with rheumatoid arthritis, ankylosing spondylitis, or psoriatic arthritis at least once every five years and possibly following any major change to treatment. 3. Risk estimation for cardiovascular disease in people with rheumatoid arthritis, ankylosing spondylitis, or psoriatic arthritis should be performed according to national guidelines, and the SCORE CVD risk prediction model if no guidelines exist. 4. Total cholesterol and high-density lipoprotein cholesterol should be used in cardiovascular risk assessment of rheumatoid arthritis, ankylosing spondylitis, and psoriatic arthritis and lipids should be measured when disease activity is stable or in remission. Non-fasting lipids are acceptable. 5. Cardiovascular risk prediction models should be adapted for people with rheumatoid arthritis by multiplying by 1.5. 6. Screening for asymptomatic atherosclerotic plaques using carotid ultrasound may be considered as part of cardiovascular risk assessment in those with rheumatoid arthritis. 7. Lifestyle recommendations should emphasize healthy diet, regular exercise, and smoking cessation. 8. Cardiovascular disease risk management should be carried out according to national guidelines for rheumatoid arthritis, ankylosing spondylitis, and psoriatic arthritis. Anti-hypertensives and statins may be used as they are in the general population. 9. NSAIDs should be prescribed with caution for rheumatoid arthritis and psoriatic arthritis, especially for people with known cardiovascular disease or known risk factors. 10. For prolonged treatment, the dose of corticosteroids should be kept low and should be tapered if remission or low disease activity occurs. Continuation of corticosteroids should be regularly reconsidered. For far too long, the increased risk of cardiovascular disease in people with rheumatoid arthritis has been overlooked and under-managed. The risk imposed by hypertension, obesity, smoking, and dyslipidemia, along with the inflammatory process that is ongoing in rheumatoid arthritis, should not be ignored. There is a need for rheumatology and primary care doctors to work in conjunction to control cardiovascular risk factors and disease activity related to rheumatoid arthritis. While research has focused on the importance of managing the cardiovascular risk associated with rheumatoid arthritis, even more research is needed. Well-defined treatment targets are still lacking. There remains a need for more definitive guidelines to effectively reduce the risk of cardiovascular disease in people with rheumatoid arthritis or other inflammatory joint diseases. Agca R. et al. EULAR recommendations for cardiovascular disease risk management in patients with rheumatoid arthritis and other forms of inflammatory joint disorders:2015/2016 update. Annals of the Rheumatic Diseases. October 2016. Barber CE et al. Gaps in Addressing Cardiovascular Risk in Rheumatoid Arthritis: Assessing Performance Using Cardiovascular Quality Indicators. Journal of Rheumatology. November 2016. Solomon DH et al. Explaining the cardiovascular risk associated with rheumatoid arthritis: traditional risk factors versus markers of rheumatoid arthritis severity. Annals of the Rheumatic Diseases. November 2010. Tournadre, Anne et al. Managing cardiovascular risk in patients with inflammatory arthritis: practical considerations. Therapeutic Advances in Musculoskeletal Disease. 2016.
van-Breulelen-van der Stoep DF et al. Cardiovascular risk in rheumatoid arthritis: how to lower the risk? Atherosclerosis. November 2013.